La Spezia, at the head of the Gulf of La Spezia in the Liguria region of Northern Italy, is the capital city of the province of La Spezia.In terms of population, La Spezia is the second city in the Liguria region, preceded just by Genoa. 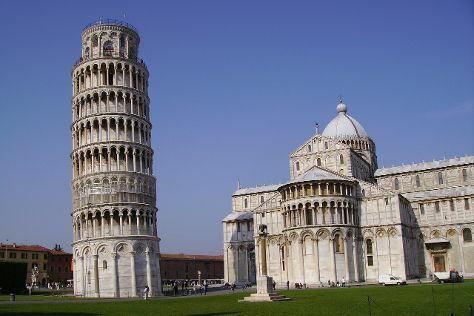 Explore La Spezia's surroundings by going to Footpath Monterosso - Vernazza (in Monterosso al Mare), Pisa (Torre di Pisa, Piazza dei Miracoli, & more) and Lucca (Le mura di Lucca, St Martin Cathedral, & more). Spend the 27th (Wed) exploring nature at Parco Nazionale Cinque Terre. The adventure continues: admire nature's wide array of creatures at Acquario di Genova, contemplate in the serene atmosphere at Cattedrale di San Lorenzo - Duomo di Genova, take a stroll through Boccadasse, and trek along Cinque Terre Trails. To see maps, ratings, other places to visit, and more tourist information, you can read our La Spezia tour planner . In June, daytime highs in La Spezia are 32°C, while nighttime lows are 18°C. Wrap up your sightseeing on the 29th (Fri) to allow time to travel back home.